Don't we just love to be busy? I tend to be a person that thrives on a schedule that's full of events, appointments and things to accomplish, but have you stopped to evaluate what exactly you're doing on a daily basis? Recently, I took some time to look at my daily habits, schedule and routine, and did a little tweaking. You see, we often think, "oh, if only I could be so-and-so, or have the life that this person does, or have an extra hour/day/week in this year.. then I could live the way I wanted to." Here's the deal, if we don't examine & adjust our daily living, how will we ever change to get to the life we want? John Maxwell, a well renown teacher on leadership, once said, "the secret to success is hidden in your daily routine." It's often times the little things done over and over, that in turn become the big achievements later. This past weekend, my pastor spoke about how we need to trade idle time for purposed time, and that means we need to evaluate what we're doing. Busyness without productivity gets us nothing but frustration, so let's set some goals, look at what needs to be done to get there, and arrange our habits accordingly. The question listed above is something I've begun to ask myself on a daily basis, and I encourage you to do so also. 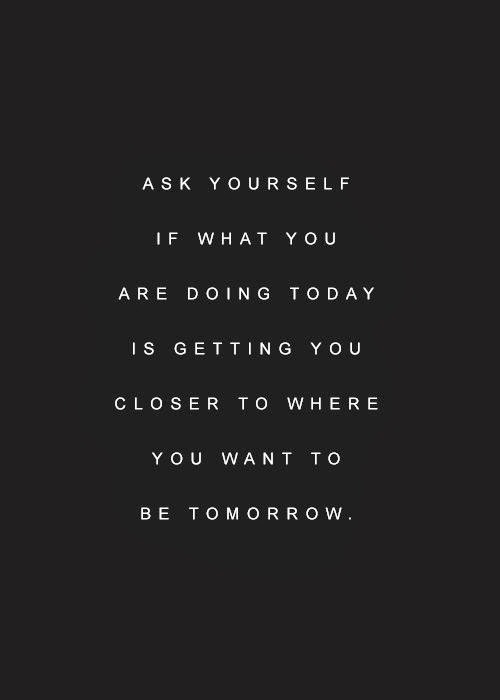 What things are you doing today to get you to where you want to be tomorrow? If it's not benefiting your future and turns into "idle time", consider using your time in a different way. When preparedness meets opportunity, that's when we see success. Here's to a productive, dream-filled, goal-oriented, incredible 2014! Get out there and make things happen!